In 1889, the Rev H H Montgomery, Doctor of Divinity, published a History of Kennington. It is a charmingly written work, and now a collector’s item. The following is an excerpt about Kennington in the days before the Norman Conquest. It is probable that there was a vast bay here, which extended as far as the hills of Camberwell and Clapham, and doubtless at high tide the gulls and wading birds disported themselves over the sites of our present houses, whilst at low tide, great stretches of flat smooth land appeared. Among the gravel of this district there occur what are called “sand basins:” These are a rich field for the fossil hunter. Mr W Syer Cuming has shown me bodies of elephants, boars, and hyenas, found in such basins in the neighbourhood of the Camberwell New Road. 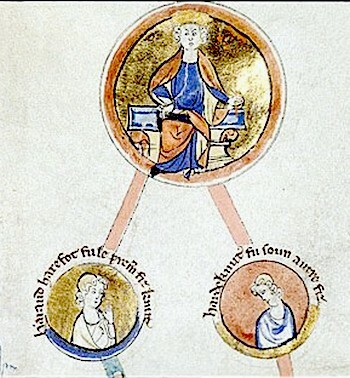 In 1042 King Hardicanute came to a wedding feast at the Palace of Kennington. “Goda, the daughter of Osgod Clapa, an English Thane of great wealth, was given in marriage to Towid the proud, a powerful Dane, the king’s banner bearer or marshal, and Hardicanute graced the banquet.” Those were hard drinking days, when men vied with each other in their cups. The king drank so deeply on this occasion that he fell down senseless and died here a few days afterwards. Where was this Royal Palace? and what is the meaning of the word Kennington? The word means “King’s Town” and suggests that it was a royal residence. Now take your stand at Kennington Cross and face the present Tramway Stables just where Upper Kennington Lane joins Kennington Road. All along that row of houses, just where the stables stand, there used to be a royal palace. It was here that Hardicanute died: and after this, a legend tells us that Harold put the Crown upon his head, probably at this place after the death of Edward the Confessor, 1066.